On Sunday, August 21st we gathered at the shore of Moraine Lake in Banff National Park. Our two families were instructed to meet at 12:30pm by the canoe rentals, not far from the parking area. We greeted each other with warm hugs and hellos. As we waited for everyone to show up, we busied ourselves applying bug spray and sunscreen, eating ham and cheese sandwiches, and taking one last trip to the loo before the hike up to Larch Valley. “I have them with me” said Mary as she glanced behind at the backpack she was carrying. Our group, 33 people aged 6 to 71, spread out quickly as the hike is challenging. Along the 4.2 km trail, we climbed through the forest along a series of switchbacks – a zigzag path that snakes left and right up the steep hill. 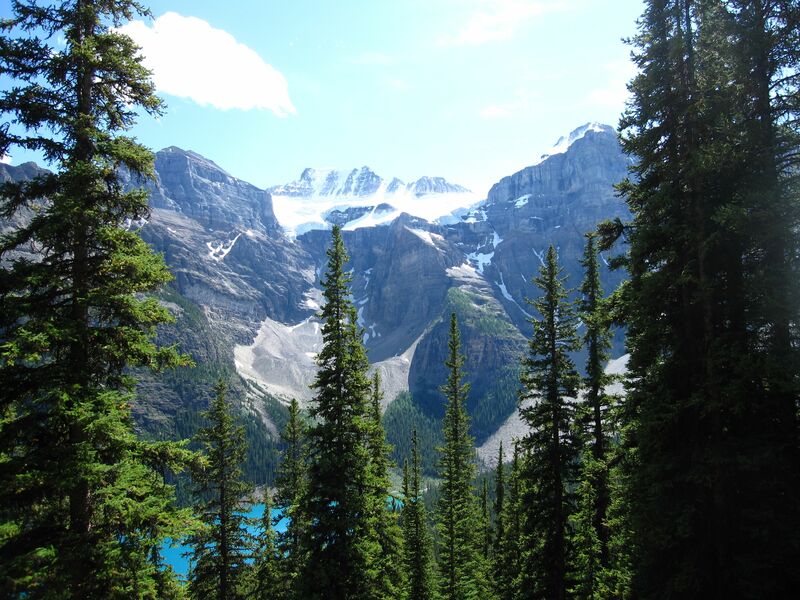 As we climbed higher and higher, we could see through the trees, Moraine Lake’s turquoise blue water glimmering below. It took us a little more than 2 hours to arrive at the pretty meadow known as Larch valley – filled with countless wild flowers, larch trees, a meandering stream and breathtaking views of the Ten Peaks that surrounded us. We were here in this meadow to spread the ashes of two young people we loved dearly. A married couple, both aged 39, who loved the Canadian Rockies. It had been almost eight months since the fatal car accident that claimed their lives and the life of one other beautiful soul. They were all driving home from a day of snowshoeing in these mountains, when their car hit an icy patch and drove into a lake. Standing in the meadow today was the sole survivor of the car crash. She had lost her husband, her brother, and her sister-in-law. She had almost lost her own life. Now a single mother of two young children, she had a challenging journey ahead. As I watched her on this sunny afternoon, I was inspired by her strength and courage. And I felt overwhelmed by a sense of gratitude that she was here with us. We could not have asked for a more beautiful day. The sun shone brightly. The wind gently cooled us from the heat. The majestic Mount Temple stood silently to the north. As I write about this experience, I wonder what really happened in Larch valley. And I can’t help but think there is a metaphor in the series of switchbacks, the zigzag trail we climbed to get to there. Peaks of Happiness. Valleys of Sorrow. If peaks and valleys can exist beautifully together in Nature, then I guess feelings of happiness and sorrow can exist in us at the same time too. Perhaps this is what our journey is all about; learning to live in duality – to experience a series of switchbacks, of joy and sorrow, all the while moving up and onward. Death feels like a dark cloud, but for me, Death has also been illuminating. I now feel a deepened awareness of how precious life is. How much my family and friends mean to me. How lucky I am to live my life. How beautiful today and everyday is. For that, I am grateful. This entry was posted in happiness and tagged death, happiness, hiking, mountains, sorrow by Lila Cheekytree. Bookmark the permalink. Peaks and valleys….life sure can be a surprise…how grateful we can all be for being able and willing to experience the fullness of life. What a beautiful description of what it was/is all about..the treasured gifts of family and friends..the beauty of nature…the awareness of the importance of these things in our lives and the cherishing of them..the knowledge that we should live life to the fullest..peaks and valley’s are life’s surprises. I think you are so right about happiness and sorrow, they do exist together and will from here on in. This trick now is finding that happiness again, not feeling guilty when I do find it, feeling the sorrow when it happens but being able to let it go. Thank you for writing about that day. You wrote it perfectly. I am also grateful to have been reminded about how precious days, friends, family are. I’ll think about the switchbacks of joy and sorrow in life every time I hike to Larch Valley now. Smooch. This is a beautiful story Lila. I hope you have great peaks of happiness in the year to come. Thanks Lila for the lovely, well written, story.